Aztec Concrete Accessories, Inc. is a leading manufacturer of plastic injection molded and concrete supports and spacers used to support steel reinforced bar in forms for the concrete construction industry. MelCap Partners acted as the sell-side advisor to Aztec. 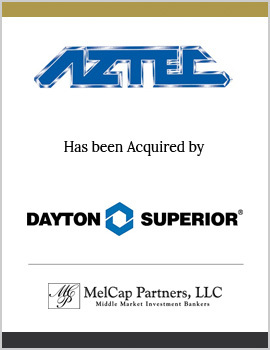 Aztec was sold to Dayton Superior Corporation, a leading manufacturer of products for the construction industry.